A lecture series cosponsored by the New York Botanical Garden, the New-York Historical Society, and the Foundation for Landscape Studies This series examined ways in which nineteenth-century parks, gardens, and paintings reflect the aesthetic values and practical technologies of the period. The overarching image of the American rural landscape in the nineteenth century is largely the result of Romantic painters loosely associated under the term Hudson River School. It is, however, increasingly clear that the view these artists provided was highly selective and, to a degree, politically motivated. This talk by Jay Cantor provided a perspective on the artistic myth of the American landscape as it was recast under prevailing economic realities to fulfill the country’s nation-making agenda. 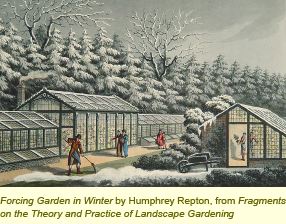 The collection of exotic plants from warm climates necessitated their protection and display in greenhouses. Concentrating on the transatlantic exchange of plants, ideas, and people, Therese O’Malley, guest curator for the New York Botanical Garden’s exhibition “Glasshouses: The Architecture of Light and Air,” discussed how this process was, and continues to be, vital to botany, horticulture, and landscape design. Thanks to the writings of Andrew Jackson Downing and through the influence of wealthy individuals who built houses and ornamental gardens, the Hudson Valley became the paradigmatic American landscape. The broader scenic context portrayed by painters, poets, and writers reinforced American taste in domestic design. David Schuyler demonstrated how this new nineteenth-century American stylistic idiom, combined with the beginnings of an indigenous historic preservation movement, fostered our self-awareness as a new nation. Andrew Jackson Downing, Frederick Law Olmsted, Calvert Vaux, and other contemporary landscape designers and their successors looked to England and also to Germany for inspiration and practical know-how. The eighteenth and nineteenth-century gardens and parks of England inspired and influenced these Americans while also affecting the work of such Continental designers as the Marquis de Giradin at Ermenonville, Prince Franz of Anhalt-Dessau at Wörlitz, and Prince Pückler at Muskau. Elizabeth Barlow Rogers showed how American landscape architecture was par of an important international trendsetting shift in garden and park design.